Enterprising Jews are still heading West to this great pioneering city, where they have met with opportunity and success for more than 150 years. in New York, captured the spirit of this flourishing Northwest city. Known alternately as the City of Roses, Stumptown and Bridge Town, Portland, which straddles the Willamette River, is a place of architectural beauty, fine foods, vibrant culture and abundant greenery—all set against the majestic backdrop of Mount St. Helens to the north and glacier-capped Mount Hood to the east. A model of city planning and environmental building that is routinely rated as one of America’s most livable cities, Portland also has a rapidly growing Jewish population. According to Steven Lowenstein’s engaging history, The Jews of Oregon, 1850-1950 (Jewish Historical Society of Oregon), Jacob Goldsmith and Lewis May, the first Jews to arrive in Portland, were drawn west in the middle of the 19th century by the allure of gold. Both German-born, they opened a general store on Front Avenue in 1849 and, in 1850, they helped start the city’s first Masonic Temple. In 1853, the first Jewish woman to arrive in Portland, a Mrs. Weinshank, opened a boarding house for Jewish bachelors. These and other early Jews were generally more concerned with survival than religion; death lurked around every corner and burial options—coffins were floated across the river on logs, then carted up to a non-Jewish cemetery—were limited. So, in 1856, Jews formed the Mount Sinai Cemetery Association to purchase land for burial. Two years later—and one year before the Oregon Territory became a state—Beth Israel, a Reform synagogue with 21 members, was established. Services were held in a loft over a livery stable and blacksmith shop; the first Jewish wedding was performed there later that year. Of the 146 merchants on record in Portland in 1860, one third were Jewish. Jews dominated the clothing industry in particular and had significant shares of the tobacco, furniture and wholesale businesses. A number of merchants achieved long-lasting success that would deeply impact the Jewish community, the city and beyond. In 1873, Aaron Meier and Emil Frank opened their first Meier and Frank department store on Front Avenue; by the early 20th century, it had become the largest department store in the Northwest. Jacob Mayer and Lewis Fleischner owned a dry-goods store reputed to be the largest west of the Mississippi. And real estate investor Ben Selling became a major philanthropist under whose leadership Portland raised more per capita for survivors of the 1903 Kishinev pogrom than any other city in the nation. In 1889, right around the time Beth Israel was built—The Oregonian called it the “handsomest temple to be found in the Northwest” (the building burned down in 1923)—a wave of Jews from Eastern Europe began to arrive. Most settled in Old South Portland, where a substantial Italian immigrant community lived. As was true throughout the United States, some divisions initially existed between the East European Jews and the older, established German Jews. But the new immigrants worked quickly to lay down roots, establishing the first Jewish newspaper in 1893 and a local chapter of the National Council of Jewish Women in 1896. By the 1920s, the community in South Portland included six shuls, kosher butchers, mikves, public and Hebrew schools, shops and bakeries. The cornerstone of the community was Neighborhood House, which hosted everything from a sewing school to Hebrew school to health services. The institution was run by the great pioneering Jewish woman Ida Loewenberg from 1912 to 1945. By 1910, a third wave of immigrants began to arrive, from Turkey and Rhodes. This new generation of Jews was, according to Lowenstein, perhaps even more deeply committed to preserving a unified and democratic society than the older generations. And even as they continued to grow in numbers and leave behind the Old South Portland neighborhood, they worked diligently to strengthen ties with all Jews, coordinating efforts to build the B’nai B’rith Building in 1914 and, in 1920, forming the Federated Jewish Societies (which later become the Jewish Federation of Portland). By the mid-1930s, the Jews in Portland had not only achieved middle-class stability but had also established a robust and cohesive community. In many ways, unity and democracy remain the core values of today’s young, dynamic Jewish community of 46,000, over half of whom have lived in Portland for less than 20 years. For instance, last spring’s Lag B’Omer celebrations at the Alpenrose Dairy Farm were sponsored by 30 local Jewish organizations, and the newly renovated Mittleman Jewish Community Center (6651 SW Capitol Highway; 503-244-0111; www.oregonjcc.org), home to Portland’s only kosher restaurant, Café at the J, has become a gathering place for Jews of all stripes. Also last spring, several Jewish organizations came together with a locally owned Jewish farm (www.sauvieis landorganics.com) to promote sustainable living in conjunction with national Jewish environmental organization Hazon. Even unaffiliated Jews have deep resources, as evident in the thriving outreach program Gesher: A Bridge Home (www.abridgehome.com), whose mission is to help unaffiliated Jews or Jews seeking more connections find their way into the community. Many major Jewish institutions are located within walking distance of one another in Southwest Portland. The Jewish Federation of Portland (6680 SW Capitol Highway; 503-245-6219; www.jewishportland.org) has an outstanding Web site listing Jewish resources across the state, and its bimonthly Jewish Review newspaper manages an up-to-the-minute community calendar (www.jewishreview.org). Chabad is next door to the federation at 6684 SW Capitol Highway (503-997-9947; www.chabadoregon.com), where it has opened Everything Jewish, Portland’s only Jewish gift store outside of the synagogues. Chabad also runs the nearby Maimonides Day School (6612 SW Capitol Highway; 503-977-7850;http://maimonides-pdx.org). A few doors down is the new building for Kesser Israel Orthodox synagogue (6698 SW Capitol Highway; 503-222-1239; www.kesserisrael.org) and, across the street, adjacent to the MJCC, is the Portland Jewish Academy day school (503-244-0126;www.portlandjewishacademy.org). A few blocks down the road is Portland’s largest congregation, Neveh Shalom, a Conservative synagogue whose emeritus rabbi, Joshua Stampfer, has been a bedrock in the Jewish community for the past 40 years (2900 SW Peaceful Lane; 503-246-8831; www.nevehshalom.org). Portland has an active Hadassah chapter (3570 SW Troy Street; 503-244-6389;www.portlandhadassah.org) located in the Multnomah Village shopping area (www.multnomahvillage.org). There, you can find an excellent bookstore, Annie Bloom’s Books (7834 SW Capitol Highway; 503-246-0053;www.annieblooms.com), which carries many Jewish titles. Across the street is the partly Israeli-owned shoe store Switch Shoes (7871 SW Capitol Highway; 503-445-4585), featuring a wide selection of shoes and accessories from Israel. Down the block is Marco’s Café, a casual restaurant with many vegetarian options (7910 SW 35th Avenue; 503-245-0199; www.marcoscafe.com). The intimate Oregon Jewish Museum (310 NW Davis Street; 503-226-3600;www.ojm.org) lets the visitor discover more about Oregon’s rich Jewish history and view innovative traveling exhibits. Established in 1989 and located in the heart of Portland’s Old Town, it is the only Jewish museum in the Pacific Northwest. Next, drive, walk or ride Portland’s outstanding public transportation system to Congregation Beth Israel (1972 NW Flanders Street; 503-222-1069; www.bethisrael-pdx. org), whose beautiful Byzantine architecture has earned it a place on the National Register of Historic Places. The 1928 building, whose design was based on the Steelerstrasse Synagogue in Essen, Germany, consists of a 100-foot dome abutted by four stair towers. The full-length bronze Ark doors each weigh 750 pounds. A few blocks north, visit the modern building that is Havurah Shalom (825 NW 18th Avenue; 503-248-4662; www.havurahshalom.org), Portland’s Reconstructionist congregation. Though it might be difficult to tell, this was formerly a film warehouse in a once-industrial area of Northwest Portland. Look for the metal sculpture of a dove on the synagogue’s east side. Several blocks west you will find the imposing masonry-and-copper Shaarie Torah (920 NW 25th Avenue; 503-226-6131; www.shaarietorah.org), the oldest Orthodox congregation in the Pacific Northwest. Inside the entrance, the shul’s past unfolds on a wall of history, an informative display 30 feet in length. The handsome sanctuary houses one of the 1,564 Torah scrolls seized from Jewish communities in Bohemia and Moravia by the Nazis, recovered in a Czechoslovakian warehouse in 1964 and subsequently put on permanent loan to synagogues around the world. While you are in the neighborhood, walk along NW 23rd Avenue, Portland’s premier shopping street, and grab a kosher bagel at Kettleman’s Bagels (2314 NW Lovejoy Street; 503-295-2314; www.kettlemanbagels.com), which uses sustainable wheat. There are also kosher-style sandwiches at Kornblatt’s Delicatessen (628 NW 23rd Avenue; 503-242-0055). After lunch, head up to Washington Park (www.washingtonparkpdx.org), one of the gems of Portland’s park system. Formerly known as City Park, its initial acreage was purchased by the city’s first Jewish mayor, Bavarian-born Bernard Goldsmith, who served from 1869 to 1871. The park’s many sights include the Japanese Garden, Hoyt Arboretum, Oregon zoo and children’s museum as well as the Oregon Holocaust Memorial. Dedicated in 2004, the memorial features a circular, cobble-stoned area meant to simulate a town square scattered with items cast in bronze—shoes, glasses—a reference to objects Jews left behind when they boarded the cattle cars as well as buried ash interred from Auschwitz and other death camps. Next, head to the award-winning International Rose Test Garden, featuring 6,800 rose bushes in 550 varieties. Adjacent to the garden is a sunken amphitheater where you can relax and take in views of snow-covered Mount Hood in the distance. A popular spot for weddings, you might even come upon a huppa being raised. The Portland Aerial Tram (www.portlandtram.org) is a short trolley car ride from downtown. On a clear day, the tram, which travels 3,300 linear feet from the newly developed South Waterfront neighborhood up to the Oregon Health and Science University, provides spectacular views of the city and surrounding mountains. The tram also runs directly over Portland’s only Sefardic shul, Congregation Ahavath Achim (3225 SW Barbur Boulevard: 503-227-0010; www.ahavathachim.com), whose Byzantine-inspired building was completed in 1965 following a failed attempt to move the old synagogue from South Portland. Though the Old South Portland Jewish neighborhood was destroyed during an urban renewal project in 1958, traces of the community remain. For those wishing to explore the area, pick up a copy of A Walking Tour of Historic Jewish Portland by Polina Olsen, a local Hadassah member, available in local bookstores and online (http://home.comcast.net/~smart_ talk_publications). The Harold Schnitzer Family Program in Judaic Studies at Portland State University (503-725-3085; www.judaic.pdx.edu) has become a hub for Jewish culture in Portland. Established in 2002, the program hosts a variety of symposia, lectures, films and other events open to the public. The Institute for Judaic Studies of the Pacific Northwest (2900 SW Peaceful Lane; 503-246-8831; http://judaic studies.org) brings Jewish writers and scholars to town, hosts literary salons with Jewish authors, organizes conferences and sponsors an annual Jewish film festival each April. One of the centerpieces of Portland’s arts scene is the Arlene Schnitzer Concert Hall (1037 SW Broadway; 503-248-4335), named after the longtime Oregon Jewish philanthropist. Originally the Portland Public Theater and now part of the Portland Center for Performing Arts (www. pcpa.com), this 1928 venue is home to the Oregon Symphony, the White Bird Dance Company and other local performing arts groups. On Sunday mornings from 10 to 11 A.M., tune in to KBOO FM’s “The Portland Yiddish Hour” (http://kboo.fm/portlandyiddishhour). 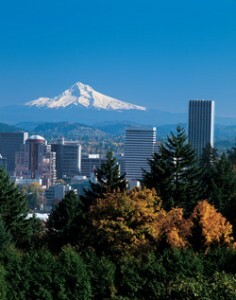 To really understand Portland, you need to get out and see the natural beauty surrounding it. An hour’s drive in any direction will bring you to several breathtaking destinations. Take a drive along the Historic Columbia River Highway (www.columbiariverhighway.com), where you will have access to innumerable waterfalls and stunning vistas of the river once navigated by Lewis and Clark. Keep heading east along I-84 to reach the picturesque town of Hood River (www.hoodriver.org), where you can watch world-class windsurfers and kiteboarders dance in the wind or, depending on the season, enjoy the delicious cherries, pears or apples on the Hood River Fruit Loop (www.hoodriverfruitloop.com), a 35-mile drive through bountiful farmland. For those who like wine, head south to the vineyards of lush Willamette Valley, known worldwide for its pinot noirs (www.willamettewines.com) produced by over 200 wineries. Beach lovers should head west to Cannon Beach (www.cannon-beach.net) on the dramatic Oregon coast, where you can eat taffy and visit Haystack Rock, a 235-foot monolith rising out of the sea. If you have time, drive another hour south to Newport, the home of Jewish composer Ernest Bloch, who wrote one third of his total repertoire here. There is a memorial for him as well as an annual Ernest Bloch Festival (www.ernestblochlegacy.org). For a quick outing, drive 20 minutes north of Portland to Sauvie Island (http://sauvieisland.org), where you can walk along the Columbia River, visit organic farm stands, pick pumpkins or meander through wildlife habitats. Jews have a long history of public service in Oregon beginning with Julius Meier, who served as governor from 1930 to 1934. The youngest son of Aaron Meier, he was the only independent to be elected governor of Oregon and one of three independents to hold the position nationwide. Oregon has had three Jewish United States Senators: Joseph Simon (1898 to 1903), Richard Neuberger (1954 to 1960) and Ron Wyden, who has served since 1996. Of Portland’s five Jewish mayors, the most recent, Vera Katz (1993 to 2005), is the only woman. Her vision for the city has been honored by the creation of the Vera Katz Eastbank Esplanade, where you can find her statue. To get a flavor of Portland’s Jewish community and its rich history, watch The Three Rabbis (www.opb.org/thethreerabbis), a documentary that tracks the stories of the former senior rabbis at the city’s three largest congregations. Bernard Malamud’s A New Life (Farrar, Straus and Giroux), written during his tenure at Oregon State University in Corvallis, is a must read for anyone visiting Oregon. Phillip Margolin, The New York Times best-selling author of more than a dozen legal thrillers, lives in Portland, where he sets many of his novels. Eric A. Kimmel, the author of some 50 children’s books, also lives in the city, where several of his books are set. According to Kimmel, he wrote the first draft of his Caldecott Honor Book, Hershel and the Hanukkah Goblins (Holiday House), while giving an exam at Portland State University. Composer David Schiff teaches at Reed College, and David Shifrin is the artistic director of the Chamber Music Northwest Summer Festival (www. cmnw.org), held at Reed College. Portland is best visited from July to October, when the rains cease and visitors can take advantage of sparkling blue skies and warm weather. Stay in downtown Portland, where you will not only have easy access to several shuls but also to great shopping, amenities, the waterfront and public transportation. Good area accommodations include Hotel Lucia (400 SW Broadway; 503-225-1717; www.hotellucia.com), a modern, Jewish-owned boutique hotel in the heart of downtown, and The Nines (525 SW Morrison Street; 877-229-9995; www.thenines.com), a recently completed luxury hotel occupying the top floors of the landmark Meier and Frank Building (now a Macy’s) next to Pioneer Courthouse Square. Portland is known for its sumptuous Northwest cuisine that relies on local ingredients such as berries, wild mushrooms and salmon. Two restaurants that excel in this cooking are Higgins (1239 SW Broadway; 503-222-9070;http://higgins.ypguides.net) and Wildwood (1221 NW Flanders Street; 503-248-9663; www.wildwoodrestaurant.com). Two good Jewish-style restaurants are Mother’s Bistro (212 SW Stark Street; 503-464-1122; www.mothersbistro.com) and Kenny and Zuke’s (1038 SW Stark Street; 503-222-3354;www.kennyandzukes.com). Hi, after reading this awesome article i am as well cheerful to share my experience here with mates.